Kiel was an important religious centre in the Middle Ages by virtue of its location along the western seaboard, and received much patronage and support. 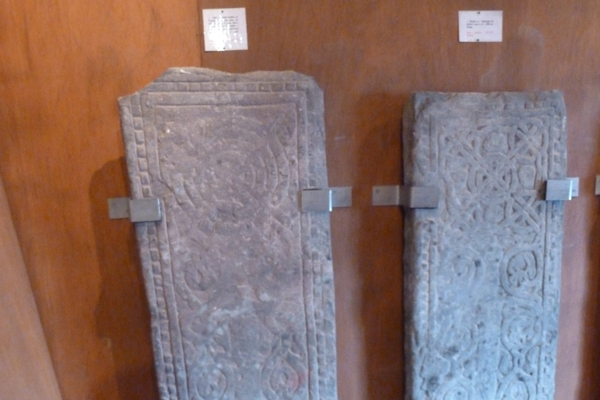 The Carved Stones of Kiel are a collection of nineteen medieval carved gravestone slabs. Seventeen stones are arranged vertically around the walls on a wooden board and two large broken slabs are placed horizontal on gravel beds on the floor on the main room of the Old Session House (approximately 7x5m). The stones were originally located in the graveyard of Kiel, and then housed in the Kiel Church, before eventually being placed in the Old Session House in 1994. 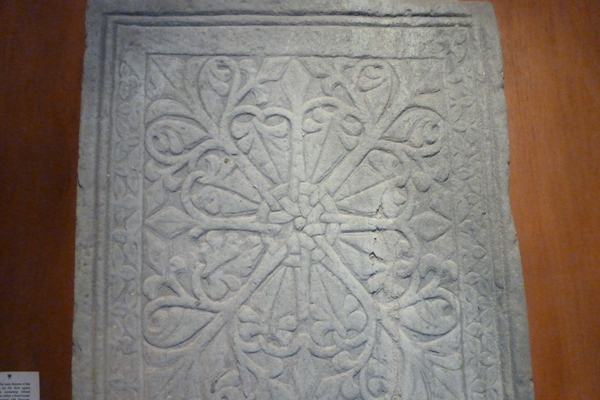 The gravestones, mainly of schist and slate, date from the 14th- 16th century, and are engraved with the intricate Celtic artwork bearing witness to the importance of the persons whose graves they adorned (e.g. chiefs and church dignitaries). Two stones date from the eighth century and are believed to represent boundary crosses. Decoration includes weaponry, tools, clergy, hunting scenes, animals (including fanciful beasts), flowers, galley ships/birlinn and scrolls. The form and subject of carving provide information as to the possible date and origin of the mason. There is also writing on two of them, as well as evidence of some of the stones being re-used. 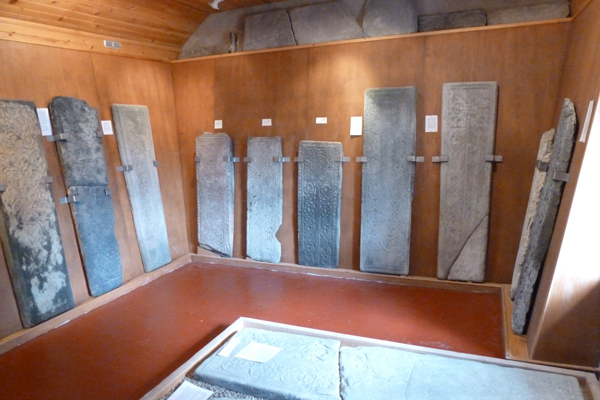 Most of the stone slabs of the Iona School and reflect the flourishing Gaelic culture under the Lordship of the Isles during the Medieval Period. One stone is from the Oronsay School, others are unknown. 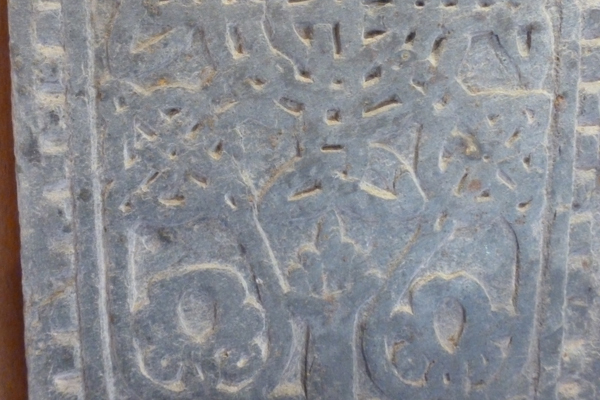 There is also a cross shaft, with depictions of hunting scene, a bishop, a chimerical beast and an inscription. The carvings are generally well preserved, although a few are heavily weathered. Each slab has an information plaque of varying length, giving information of the possible date of carving, a detailed description of the carving and its significance where known, former location and other useful information on the stone type etc. 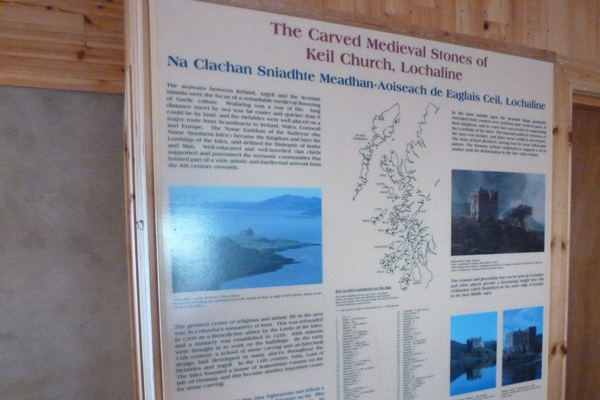 The porch in the Old Session House contains an interpretation board, entitled ‘The Carved Medieval Stones of Kiel Church, Lochaline’. Another interpretation board in the main room documents the importance of monasteries as centres of religious and artistic life, and schools of stone carving ( Iona, Oronsay and Islay). 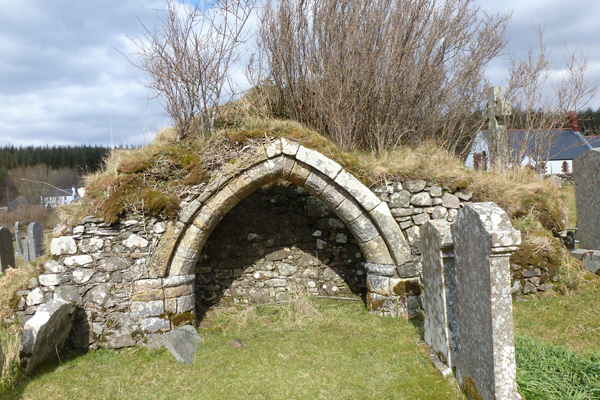 There is also a map depicting sites of other medieval stones in the Western Highlands and Isles. Information leaflets produced by the Morvern Heritage Society also provide some useful information to aid interpretation of the displays. 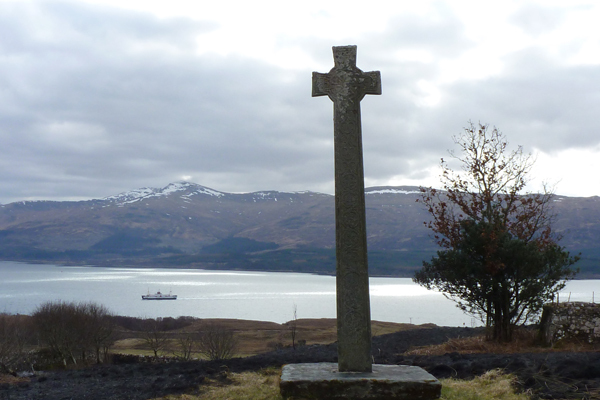 In the grounds of there graveyard there is also an impressive 14th century ‘disc-headed’ Celtic cross, with engraving of plantscrolls and pair of dragon’s heads, overlooking the Sound of Mull towards Ardtornish Castle, the ancestral seat of the Lord of the Isles. Look out for the remains of a pre-Reformation stone arch and other remnants from a medieval church at Kiel. 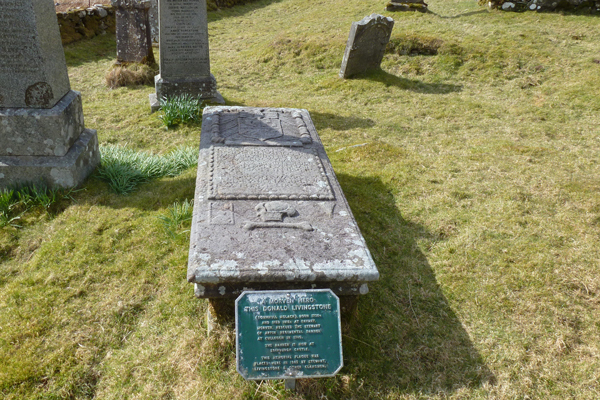 There are also many interesting, ancient gravestones, of particular note is a gravestone with an inscription commemorating the bravery of a young ‘Donald Livingstone who rescued the Stewart Appin Regimental Banner at Culloden’. The banner now resides in Edinburgh Castle. 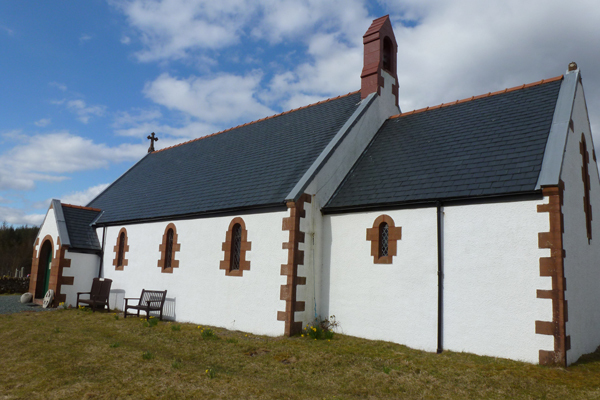 The late 19th century church is also worth a visit. The exterior is white harled with red sandstone trimmings around the windows, entrances, chimneys, archways and edges, and stained glass windows. The church replaces a late eighteenth century parish church, and the medieval 13th century church. Park by Kiel Church and head towards a small stone building (Old Session House) at the far side of the church, as directed. The Old Session House was built in late 18 century and originally served as the Schoolmaster’s House. It now houses the display of the Carved Stones of Kiel arranged around the walls and on floor of the main room. For further information about the stones, please refer to The Carved Stones of Kiel by I. Thornber (2000) and The Carved Stones of Kiel by Jenni Hodgson. Hodgson, J. 2004. 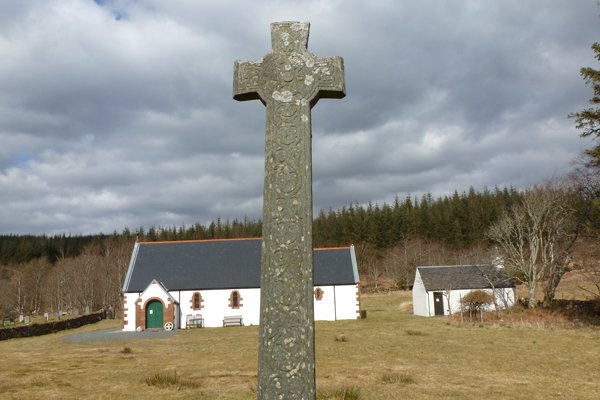 The Carved Stones of Kiel in Exploring Morvern, Morvern Heritage Society.